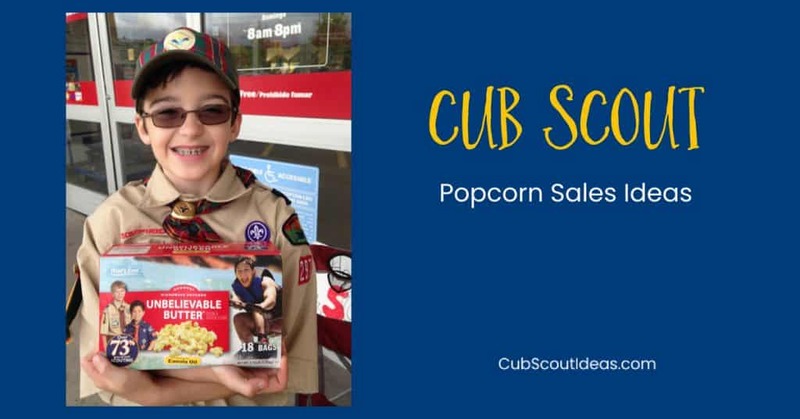 Want to make your Cub Scout popcorn sale successful even with a small pack? Check out these 6 ideas to help increase your popcorn sales this year. 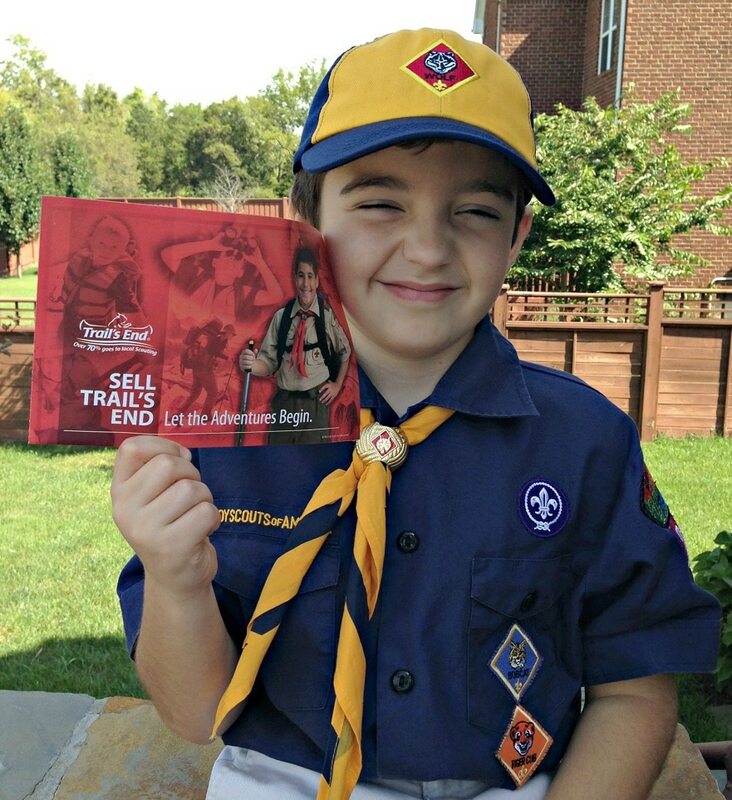 Our pack had an AWESOME Cub Scout popcorn sale a couple of years ago! Our total was $17,893 which was a 75% increase over prior year’s total of $10,146! Now, I know that the first thing I always ask when I hear popcorn numbers is, “How many boys are in your pack?” We have 32 boys in our pack, but not all of them sold popcorn. I wish I knew the secret of how we increased our sales so much this year, but frankly, I don’t. But here are some things that I think contributed to the increase. 1. 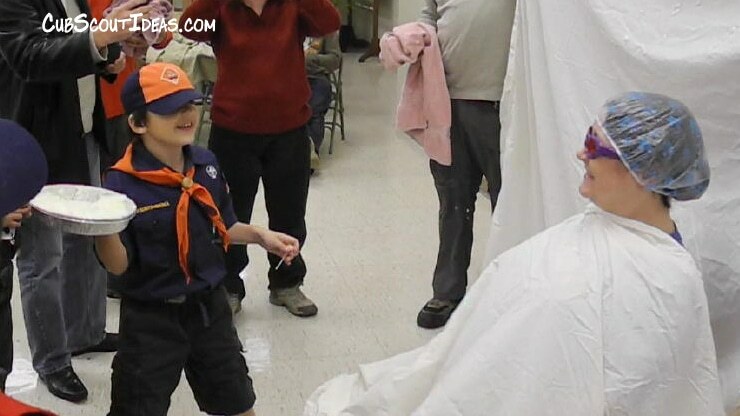 AWESOME Cub Scout Popcorn Kernel! We are so lucky to have Janelle as our great popcorn kernel! This is her second year of doing the job, and both years she’s done a fabulous job. She’s enthusiastic, organized and dedicated. Janelle has implemented quite a few new things for our sale over the last two years, and I’ll list those out separately. We owe her and her husband, David, a huge thank you! Janelle arranged for us to have show & sells at Kroger (a grocery store chain), a local Ace hardware store and Lowe’s. She limited the number of boys who could sign up for each shift, but she made sure there were enough dates and locations for everyone to participate if they wanted to. Janelle also made sure that we had plenty of popcorn to sell. Last year, we set up a Square account so that we could take credit and debit cards at our show & sells. I knew that we would definitely use it, but I never thought it would actually save sales. When folks would tell us they didn’t have any cash, the boys would say, “We take credit cards!” I was really shocked by the number of people who walked back to the table to buy popcorn! I’m not sure if the other boys did this, but I had to explain to Grant that it was ok to say that when someone said they didn’t have cash, but it was not ok to say that if they told us they couldn’t afford it. The goal for each boy was $250. In addition to other prizes, their spring dues are waived if they met their goal. Janelle created goal kits, which was an assortment of popcorn products that were just over $250 in value. Families could check out the goal kit and sell around their neighborhood. There was no obligation, so the family could return whatever they didn’t sell. And they could always get more products too! 4. 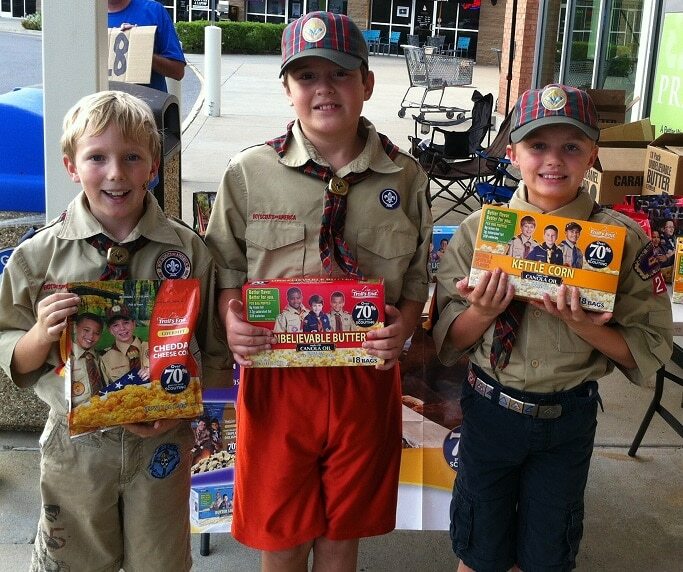 Great Cub Scout Popcorn Prizes! Rather than using the prize program that Trails End offered, Janelle decided to create her own. She, David and their two sons visited stores and decided what to include. For each sales level, she had four or five prize options. The boys could also choose a gift card. This was a lot of work for her, but because she knows our boys, Janelle was able to pick prizes that would incent them. Having a gift card option at every level and allowing the boys to pick the store also encouraged them. I’ve been asked how Janelle set up the prizes. I checked with her, and here’s what she told me. She used the percentage difference between using the Trail’s End prizes and not using them. I’m not sure if every council does this, but our commission percentage depends on whether or not we use their prizes. For example, let’s say using Trail’s End prizes, we get 30% commission and not using them, we got 35%. Janelle made her total prize budget 5% of the sales. Then for the levels, she applied that same 5%. If there was a $1-$300 level, she chose prizes worth between $8 and $15. She guessed at the level breaks ($300, $500, $1000) based on what Trails’ End did and what seemed reasonable or best at creating motivation. Janelle and her husband David made a few trips to local stores, noting items they thought the boys would like in various price ranges. They didn’t buy anything until the boy earned it and chose it. That meant she took a calculated risk that an item might no longer be available or the prices would change, but the risk was small. Since our pack did prizes in November, Janelle was able to get holiday sale prices on some of the items! We also did the whole “gift card” option once we got to the higher levels since we had fewer prize options. Janelle said that she had “WAY more levels and prizes than were necessary,” but since she didn’t actually buy them until they were earned, it wasn’t an issue. Even though we had more levels than we needed, the prize list was more like a wish list, and it did help motivate the boys. This year, our council tried something new, and I believe it helped our sales! We had mystery houses. One hundred homes in our council were asked to participate as a mystery house. The houses were each given a gift card. The retailers and monetary denominations varied. I believe that each district was given a certain number of cards based on the number of Scouts in that district. Every Monday, a clue to the whereabouts of the houses would be published on the Council website. Whenever a boy figured out the location, he would go to the house to sell popcorn. If he wore his uniform and asked for the sale politely, he would be given the gift card! The website would be updated to show that the card had been given out. Some of the houses were discovered right away while others weren’t found until the very last clue which listed the actual address. This was really fun! I know it definitely motivated the boys in our pack! Five of our boys found a mystery house. Our pack usually helps at the PTO’s “Popsicles on the Patio” event which is held the night before school starts. We can’t have an official recruitment table, but we can pass out flyers and talk to people. This year, we met a family who had just moved to the area. The mom told us that her son sold $5,000 worth of popcorn for their former pack. I would love to hear what has helped you with your popcorn sale! P.S. If you’re looking for more fundraising ideas, get your FREE guide from Fundraising.com. Thanks for all the great ideas. How did you set up the Square? Do you have it going directly into the Pack account? Thanks! Our treasurer set it up, but it sounds like it’s pretty simple. I believe he has to go into the Square account and tell it to move the money over into our pack account. Hope that helps! Hello, I LOVE the idea of unit specific (i.e. : Not Trail’s End prizes) Can you elaborate on how your kernel budgeted for this and give a few prize levels with example prizes? I want to submit this to our committee to vote on this summer but I am having a bit of a hard time determining how much to budget… prizes are pretty straight forward based on what I know of the boys in my pack. Thank you! Hi! I just sent an email to our kernel to double check. I’ll let you know when I hear back from her. Thanks!